We are back! 5 things I miss about South East Asia. Well. We are back and I’ve decided to start a travel blog because I have been well and truly bitten with the travel bug and can’t wait to get the backpack back on my back. I was quite nervous about my first traveling experience. I’ve been to lots of countries but always just on a nice city break or beach holiday. None of these compare to the experience we had in Vietnam and Cambodia. I’m going to be writing about the experiences we had in various places including reviews, advice and a few anecdotes. I shall start with the top 5 slightly random things I miss about South East Asia aside from the sun, people and beautiful places. 1. Iced coffee. The iced coffee over there is absolutely amazing. It tastes like a fancy frappe/frappucino type drink but better and so CHEAP. You can generally get one for $1-2. 2. Singing aloud in public. I love to sing anywhere and anytime. In Cambodia I heard so many people randomly singing including one guy singing Justin Bieber Boyfriend on the bus. 3. Foot massages. You can easily get an amazing 30 min foot message for $3. During my second foot massage the girl just telling me she loved my lips and kept making kissing noises. Slightly strange! 4. Observing the crazy things you see on motorbikes. It is not unusual to see 3-5 people on one bike, in fact, a bike with only one rider looks quite empty. 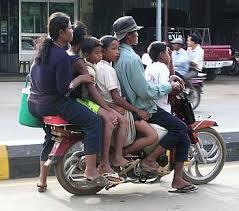 The passengers include anyone from children, babies, monks, people in formal evening wear and girls riding side saddle. 5. The smell of street food. 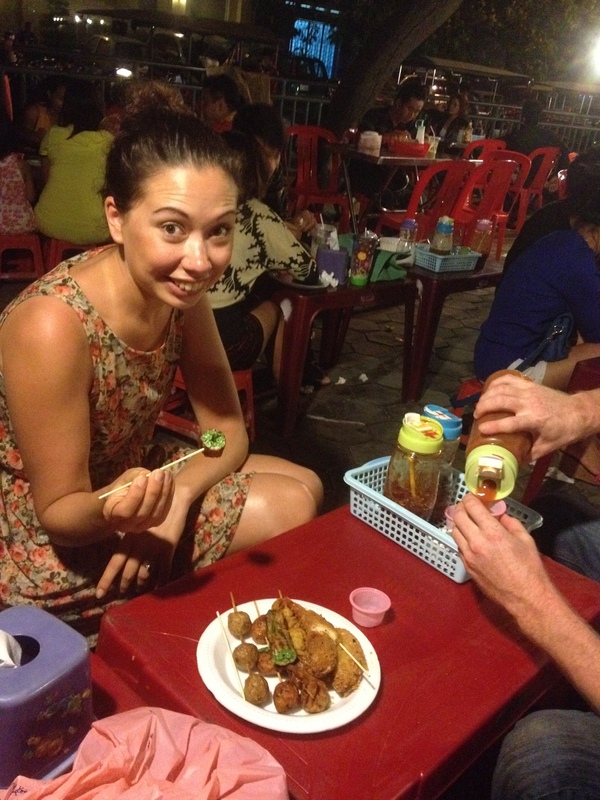 There is street food everywhere ranging from deep fried spiders and beetles and baby birds to spring rolls and noodles. It smells amazing. When we got up at 4.30am to see sunrise at Angkor Wat there were already people on the streets setting up their food stalls. By the end of our trip we were brave enough to try some street food. No idea what it was but it was amazing and I was very happy that we got to eat it on tiny plastic chairs at a tiny table on the street in true Cambodian style. I can’t wait to write more about our travels. Next I’ll be writing about our time in Ho Chi Minh city so keep checking back! I can relate to all these things! I miss SE Asia! Great post. Thanks Nick. Your site is looking great btw!